In a small bowl mix the cumin, cayenne pepper and chill powder. Rub generously over the Haddock fillets on both sides. Heat the olive oil in a large skillet over medium heat. Add the fish to the skillet and cook for about 3 minutes on each side. You want to make sure it gets almost blackened and that the fish is cooked through, inside it should be white. Remove fish from skillet and shred with a couple forks. In the same skillet add, garlic, green onions, corn and red pepper. Season with salt and pepper if preferred. Stir and cook. Let it cook for a couple minutes then stir again. You want to make sure the corn is brown and looks roasted. Add beans and cook until beans are heated through. 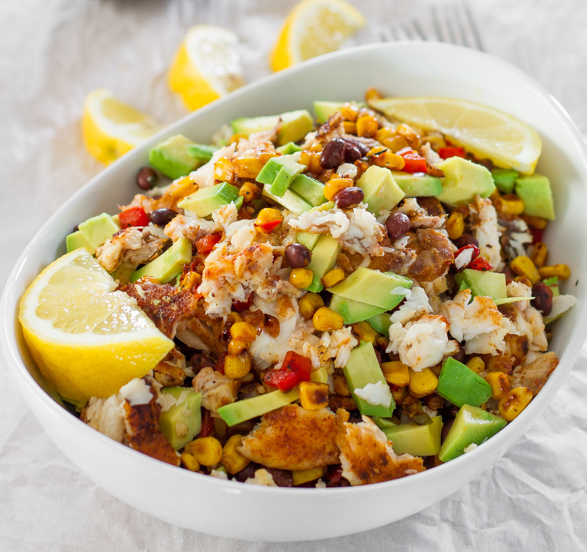 To serve, layer rice, corn/bean mixture, fish, avocados and sprinkle with fresh lemon juice.